I can’t catch my breath or hear myself think, what with political divisiveness having reached Dostoyevskian proportions, my head spinning from the nonstop barrage of news—most of it bad, all of it “breaking”—and the general anxiety in the air. 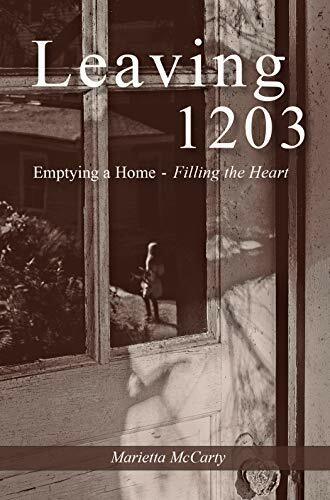 And yet, recently, out of this maelstrom there has emerged a miraculous little book by philosopher and best-selling author Marietta McCarty called Leaving 1203: Emptying a Home, Filling the Heart. In it, the author recounts her three-month summer odyssey of emptying her late mother’s home and rediscovering the values that make life worth living. 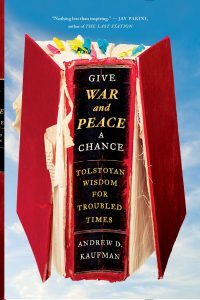 How could a book on such a modest subject touch on anything as urgent as the great battles of the moment? That’s just the thing. When you join McCarty on her journey through her childhood home, the raging seas recede, the ground beneath your feet appears once again. In poetic prose that hums with the simple grandeur of everyday life, this intimate book both enlightens and inspires you, making it impossible ever to look at a human being, or a house, or a starlit night, in the same way again. In twelve brisk chapters, each one focusing on a few “small” objects that McCarty discovers during the home-emptying process, the author takes us on a journey not only into her roots but into ours, refocusing our gaze on the big little things that are everything in life. For instance, a discovered worn leather messenger bag, which McCarty’s father once carried as a Navy pilot flying rescue missions in the Pacific Theater, becomes a portal into the unsung heroism and unspoken horrors of World War II. The mystery of the muted pain McCarty had always sensed in her father has finally been unraveled decades after his death: It was a sadness, McCarty now understands, that came from his having witnessed the sort of human suffering that no father would ever want to have to explain to his young daughter. The book’s main character is the home itself, oozing with activity and love and “mismatched everything,” yet unmatched in its ability to draw out the very best in its inhabitants and their many guests. The other main protagonist, after the house, is Billy G. McCarty, the author’s furry-noggined canine companion who supported McCarty both in the final years of her mother’s life and during the home-emptying process. Only McCarty doesn’t take Billy on walks; Billy takes her on walks, a charmingly quirky detail that will ring true to anyone who has ever loved and been loved by a pet. Then there’s the author’s mother, June, a wise-cracking, wise-living woman who would be remembered for the raucous good cheer she brought into the lives of the residents of the nursing home where she volunteered for years. June’s persona only becomes more elusively human after the author discovers her mother’s personal collection of memorabilia consisting of, among other things, an ad for a Live-on-Stage, adults-only performance by Marsha Mellow, reports of rehabilitating a chimpanzee with mental disorders, two copies of ‘Prayer to St. Jude,’ patron of lost causes…and E. B. White’s Acceptance speech for his 1971 National Medal for Literature. There’s no sound-byte social commentary or fast-food philosophy in this book. But there’s commentary all the same, gently delivered through stories like the one McCarty tells about discovering in her former bedroom closet the very tennis racket she’d used some forty years earlier, in 1963, in the first-ever integrated tennis match on Richmond’s courts. And, as we’d expect of an author whose previous titles include Little Big Minds: Sharing Philosophy with Kids, How Philosophy Can Save Your Life: Ten Ideas that Matter Most, and The Philosopher’s Table: How To Start Your Philosophy Dinner Club—Monthly Conversation, Music, and Recipes, there’s philosophy aplenty in Leaving 1203, taught with the inimitably soft touch for which McCarty is known. I was especially moved to discover, right alongside the author who came across a giant wooden desk in her basement, that it was precisely in that room and at that desk, many decades earlier, that she first became a philosopher. Stories of those free-flowing basement chats between father and daughter, two “basement philosophers” bonding over their shared love for one another and for the mysteries of the universe, are a beautiful reminder that love and wisdom are always inextricably linked. In Leaving 1203, McCarty teaches us to do something most of us don’t do very well: pay attention. The sounds of each season come alive, the unique colors and contours of every species of growth in her mother’s garden, the taste and odors of each food item contained in those sprawling picnic baskets of her youth. Reading this book was, for me, like being wrapped in my favorite childhood blanket, frolicking through a world so right and true, so full of promise and rich in love, that I didn’t want to leave. But, like McCarty and her companion, Billy, I had to, and when I did, a most exquisite thing happened: I found myself looking at my own life with a fresh set of eyes and a newly awakened consciousness. Suddenly, I discovered the lesson the book had been trying to teach me all along: 1203 is inside me, inside every one of us, right here, right now, no matter the circumstances of our lives or how far we may have strayed from our True North. It grew dark on the patio. Ah, yes, outdoor nighttime gatherings give me back my childhood. When I glean the inviting hum of easygoing, starlit conversations, I hear once more those loved voices of yesteryear, naturally lowered as the sunset on the patio—Sunday’s warm, soothing timbre at closing time. Lightning bugs blink, globes protect candles from the wind, clusters of votives burn low. The moon, from sliver to round, lights the night. The Little Dipper befriends me as ever. And the North Star fascinates and comforts as it did when I twirled a ping-pong paddle, reassuring in its consistency, a sign that I can always find my way home. On the 1203 patio, I first marveled that the earth was spinning, and I sought any inkling of movement with bare feet planted on blue slate. Nighttime is the right time to plant bare feet again. Come, let’s dawdle. Swing with me. Stand still, time. Tickle my fancy, North Star. Learn more about Marietta McCarty here. Connect with Dr. Kaufman on Amazon, Twitter, Facebook, Google+, LinkedIn, and YouTube, and sign up for his newsletter here. Follow Books Behind Bars on Twitter and Facebook. I can only say , “WOW”! Two marvelous writers: McCarty & Kaufman. Great review! Catch Marietta when she returns to Puck’s Market at the Tuckahoe Shopping Center, where she had her first job, and just a hop, skip, and jump away from Marietta’s home at 1203 Essex. Join us Saturday, December 1 for good food, tasty wines, and a premiere musical performance at Puck’s. Guitarist and singer/songwriter Jonathan Mudd — Marietta’s cousin — will perform three 1203-inspired songs. Make your reservations by calling Puck’s at (804) 285-3760, emailing [email protected], or at Eventbrite. Don’t be late—settle in for a fun evening with lively discussion, good food and wine — starting at 7:00 pm. (Marietta’s presentation starts at 7:30 pm.) The $30 price includes a copy of “Leaving 1203,” a tasting of 6 wines, and a glass of wine to accompany this delicious menu featuring food from “1203.” Additional copies of “Leaving 1203” will be available for purchase and signing. Come join us! Copyright © 2019 Andrew D. Kaufman. Site by AuthorBytes.